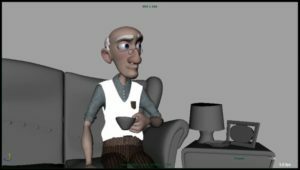 This showreel solely focuses on my animation skills and is aimed towards animation studios or people who are specifically looking for 3D- or Character-Animation. Animation of the Stag Beetle . Background-Characters were handled by another animator. Click here for my full animation breakdown to “Die Geschichte einer Legende”. Lead Animator for “Rupert” the scarecrow. I was also responsible for Rigging “Rupert” and the nCloth Simulation of his poncho, pants and belts. Selected scenes from the short. I animated all visible 3d-objects. I was also responsible for Rigging, Matchmoving and Motion Tracking of the (invisible) CG-standin for shadows and cutoffs. Animation of “John” looking for his caterpillar. As the Project wasn’t finished at the time of writing I used the Soundtrack from RIFT, which was done by Andreas Posch. Animation Process for the Scarecrow from Reference to final output. For more tasks on this project, see 2. Animation of all visible characters (alpine climber “Walther” and the demon). For more tasks on this project, see 4. Animation of the Scarecrow (Foreground character), Background characters were handled by another animator. If not stated otherwise, every clip uses its original soundtrack.